The USDA needs to tighten federal standards to prohibit the use for crop irrigation of fracking wastewater from oil and gas drilling, and from the nation’s municipal sewage treatment systems, in organic food production. Research shows that the copious amounts of frack wastewater, a byproduct of the hydraulic fracturing technique in gas and oil production, are contaminated with toxic chemicals and oil. And recent reporting has indicated its use in growing organic food in California. Effluent from sewage plants, which co-mingles waste from domestic and industrial sources, can contain pathogens and drug residues in addition to heavy metals and toxic chemicals and should similarly be prohibited for use in the growing of organic food. 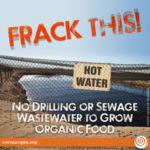 Please add your name to the petition to let the USDA know that fracking and sewage wastewaters should not be used to grow organic crops. Published research indicates that certain plants are very efficient in taking up chemical and pharmaceutical residues from the soil where they then can accumulate in the plant’s tissue. Recycled/treated oil or gas wastewater used for irrigation can be contaminated by a variety of chemicals, including industrial solvents such as acetone and methylene chloride, and hydrocarbons (oil components). Sewage sludge was banned from organic use due to concerns that the domestic waste stream and industrial sewage are combined, thus rendering the byproducts contaminated with heavy metals, pharmaceuticals, and other toxins found in industrial sewage. But the use of wastewater from sewage plants is still allowed. To keep organic food as pure as possible it’s important that we quickly promulgate regulations that will ban risky wastewater uses, as tempting as this is in drought-impacted states like California, from contaminating our food supply. 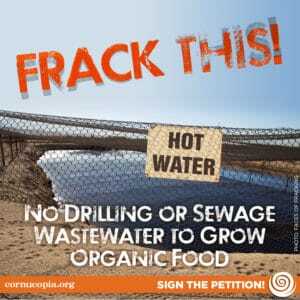 Click here to sign the petition to ban the use of fracking and sewage wastewater in the growing of organic food.